Monolayers of transition-metal dichalcogenide semiconductors present spin-valley locked electronic bands, a property with applications in valleytronics and spintronics that is usually believed to be absent in their centrosymmetric (as the bilayer or bulk) counterparts. Here we show that bulk 2H−MoS2 hides a spin-polarized nature of states determining its direct band gap, with the spin sequence of valence and conduction bands expected for its single layer. This relevant finding is attained by investigating the behavior of the binding energy of A and B excitons under high pressure, by means of absorption measurements and density-functional-theory calculations. These results raise an unusual situation in which bright and dark exciton degeneracy is naturally broken in a centrosymmetric material. Additionally, the phonon-assisted scattering process of excitons has been studied by analyzing the pressure dependence of the linewidth of discrete excitons observed at the absorption coefficient edge of 2H−MoS2. Also, the pressure dependence of the indirect optical transitions of bulk 2H−MoS2 has been analyzed by absorption measurements and density-functional-theory calculations. 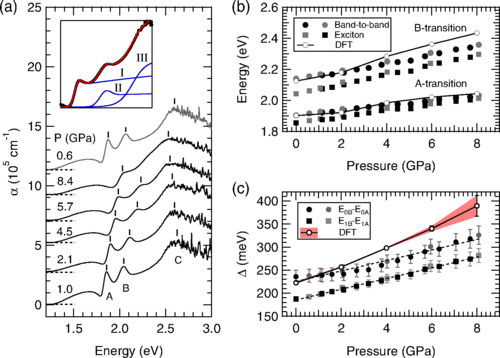 These results reflect a progressive closure of the indirect band gap as pressure increases, indicating that metallization of bulk MoS2 may occur at pressures higher than 26 GPa.